An Enriching Start to 2018! 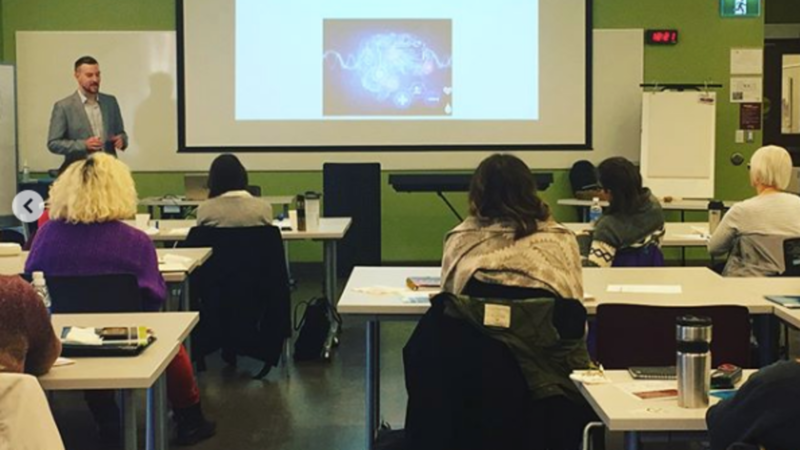 On Saturday January 13th, 2018 the Ontario Music Therapy Academy held a workshop entitled, 'Music and Neuroscience: New Approaches in Neurorehabilitation'. There is much interest in this topic in the music therapy field and healthcare as a whole, which was evident in the variance and amount of attendees at the workshop. Professionals including music therapists, recreation therapists, speech-language pathologists, and more, came to learn from Brian Harris, CEO of MedRhythms and Neurologic Music Therapist. Brian began the workshop by discussing some basic neuroscience principles, such as: global activation, neuroplasticity, and entrainment. He then explained how music works with these principles and how it literally changes how the brain functions. Brian proceeded to break music down into 4 objective cues: melodic, harmonic, rhythmic, and force. We spoke further about rhythm and how it needs to be present and strong when utilizing NMT techniques as it elicits the auditory-motor response. He demonstrated how these Neurologic Music Therapy techniques can be implemented in rehabilitation after stroke or injury. He showed examples of the work he is doing in rehabilitation hospitals and how the patients are improving from their base measurements with these interventions. Tools, tips, and interests were presented, with demonstrative examples where attendees could get involved and practice. Brian wrapped up the workshop with a question and answer period which had enthusiastic participation by attendees. On Sunday February 4th 2018 the OMTA gathered once again with music therapists and musicians alike to provide our very first hands on workshop, 'Hands On! Ears On! Guitar Workshop'. While other workshops have had lots of opportunities to participate, this workshop was specifically prepared to develop hands-on musical skills to apply to music therapy settings. Workshop facilitator, Brian Katz, started the afternoon off by getting everyone loose and limber before picking up the guitar. Participants appeared to quickly get comfortable with Brian’s fun and playful call and response games. We then got to relax our bodies with some deep cleansing breaths and stretching. Once these opening activities were completed everyone sat in a circle with their guitars and proceeded to do another call and response activity with single string melodies. This allowed Brian to appropriately gage the groups abilities on the guitar, which he then used to guide the rest of the afternoon. Following this, Brian taught the group how to practice both rest stroke and free stroke picking styles. 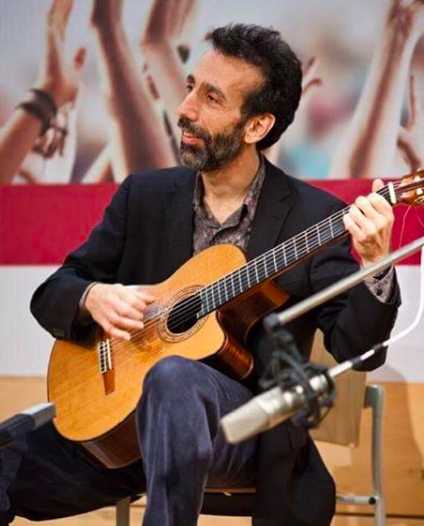 He untangled some of the mysteries that often confuse people with the guitar neck, and showed the participants how to practice the chromatic scale, all while using the finger picking stroke he specified. 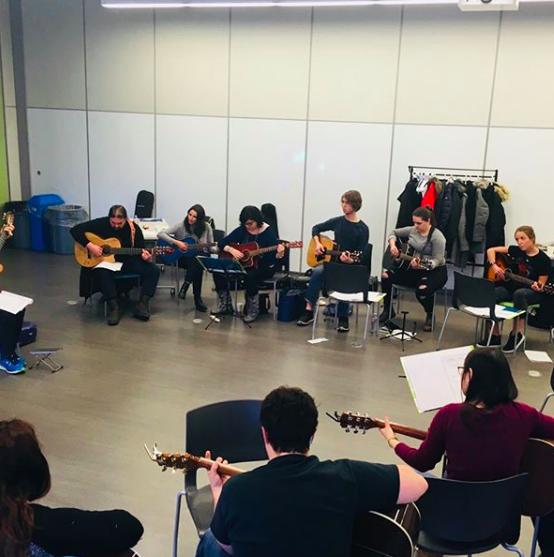 Close to the end of the workshop, we played the blues as a group, in order to practice picking to different rhythms and accents, and to allow individuals to solo (especially if they never have)! Brian did an excellent job encouraging the group as well as giving individual attention to participants throughout. This workshop provided new tools to practice moving forward, and laid a strong foundation for the next workshop on April 22nd ‘Finding your Groove’ with facilitator, Aaoron Lightstone.